John Chumack took this image of the Aurora Borealis on a 2016 trip to Alaska, an annual event for him and a group of skywatchers. This image of the aurora borealis reminds astrophotographer John Chumack of another cosmic beauty – a barred spiral galaxy. 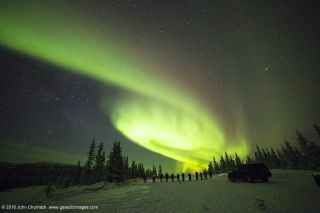 Chumack took the image on a 2016 trip to Alaska, an annual event for him and a group of skywatchers.